One week from now will be the most important day of the Christian year. Resurrection Sunday, the first day of the glorious season of Easter, is rightfully observed by the church as the central holiday on its entire calendar. The resurrection of Jesus results in our salvation, that our coming resurrection is as sure as 2 comes after 1, that the apparent defeat of Jesus on the cross was actually a divine victory and a rescue of frail humanity. But the resurrection also means Jesus’ vindication after suffering a horrible, and otherwise disgraceful, death. This vindication of Jesus entails that Jesus really is the king of Israel, and as God would have it, the Lord of the world. Palm Sunday fits perfectly a week before Easter. We so often forget, or hardly ever understand, that the cross and the empty tomb don’t simply mean our salvation. They show us who Jesus is as king. He rides into Jerusalem on a donkey among the palm fronds and the cries of “Hosanna” by the ones who recognize him as the Messiah, the rightful king of Israel, and though he does it for you, it’s not about what you get. It’s rather about Jesus getting his due. And he has no problem making this clear, and exalting himself among the praises of the people as he rides to meet the cross, the greatest act of humble service that the world has ever known. I know many people would think about this reminder, “Of course, Jesus is king. We know this.” But I think so often we have it backward, as if Jesus comes to save us and we get to praise him in return by hailing him as king. But Jesus’ kingship is not the reward that he gets for saving us–our salvation is the reward that is graciously passed on to us because of his kingship. The cross and the empty tomb are drained of any meaning apart from the reality that Christ is King. 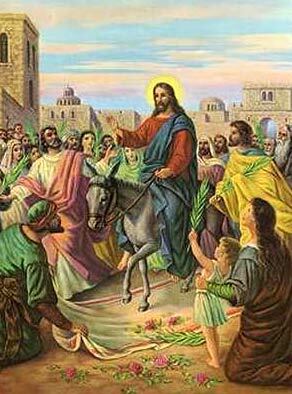 This is what I remember on Palm Sunday.